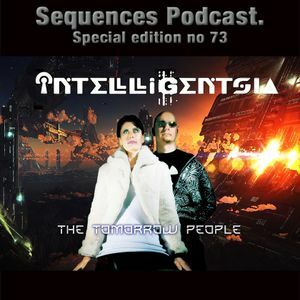 Sequences Podcast Special Edition No73 Intelligentsia "The Tomorrow People"
This show was 19th in the global world music chart and 63rd in the global chillout chart. “THE TOMORROW PEOPLE” is an album that has been slowly building for years in 4 different studios in Japan and the UK. One of the issues of this album is that it’s such a big production I’ve yet been able to put it together in its final state. Especially the recording and arranging of the needed male and female opera vocals and other studio musicians. before I go through each song rebuilding and remastering for a release date which will probably be in a couple of years. The theme of the album started from and is based on the birth of the Internet and the attributes of our ever increasing connected planet. The female vocal talents feature the Australian Opera singer Bronwen Stephens, Yan Kuang from Shanghai, and Adeyto (from Europe/Japan).